Musings of a Bookish Kitty: Sunday Salon: Hello, October! Outside my window: Fog. Beautiful, glorious fog. Only pleasant because I'm not driving in it. I am listening to: The wind dancing with the trees. I love how quiet it is outside. At our old house, the traffic and trains were a constant. Here, we have the occasional jet, sometimes the laughter and screaming of kids playing in the neighbor's pool, but mostly just quiet. I am watching: We've completed the fourth season of How I Met Your Mother and are just waiting for the first disk of the fifth season to arrive in the mail via Netflix. Or Quickster. Whatever their name is now. I saw the first episode of the new Charlies' Angels show. Just because. Anjin and I also saw the first two episodes of the new season of Supernatural. We're finally all caught up! So far, it looks like it will be a good season. I am thinking: That I need to get started on the laundry. Actually, I have been giving my blog a lot of thought. Ideas are starting to pop into my head for future posts, however fleetingly. Not all of them are as good as they seem upon first thought. I am grateful for: Hot water. I am reading: I finished Madelyn Alt's The Trouble With Magic early last week, a witchy cozy mystery. Now I've moved onto Bossypants by Tina Fey, an unusual choice for me for two reasons. Number one, I don't especially care for celebrity memoirs and so rarely read them. And number two, it's in audio book form. Yeah. It's hard to believe, isn't it? I found the perfect time to listen finally. Not sure how long it will last though as the situation is only temporary. Around the house: So much still to do! When does the unpacking end?? Plans for the week: Mouse had her doctor's appointment last week and I have mine this week. I am a strong believer in making those annoying female exams less painful by turning them into a fun day. So, I will be taking the day off from work and will be treating myself to a little shopping, including a visit to the bookstore, picking Mouse up from daycare early and spending the afternoon playing and cuddling with her. The rest of the week will be filled with the usual: work, sleep, eating. You get the idea. On the blog: This past week I managed to post a review of Cover-Up by Michele Martinez and talked about the top five songs currently playing in my head. This week look for my review of Madelyn Alt's The Trouble with Magic and the story that's made Mouse quite famous--afterward you will be able to guess what she'll end up with lots of on her first birthday (because I'm the mean mommy who won't let her have it just yet)! Happy October! What a beautiful picture of Mouse in front of your bookshelves! Supernatural definitely is looking more promising than last season! That picture is adorable! I can't believe how big Mouse is! She looks so busy and intent on what's she doing. I love it when they get to the age where they make a serious business of playing. She is becoming her own little person! Mouse looks so adorable standing there playing like that! It sounds like you are enjoying the peacefulness of fall, and I am glad that you will get the chance to have a day off with cuddling time soon because you deserve it. Have a great afternoon with the little one! I can't believe how big Mouse is getting already!!! I've seen that a lot of people are reading/have read Bossypants so I'll be interested in hearing your thoughts on it when you finish. Hope you have a wonderful week! Ooooohhh, Mouse looks adorable! So sweet. Bossypants was my very first audiobook, a few months ago, and it was a perfect way to read it - I hope you love it! And Mouse is really growing (and looking so at home near your bookshelves :-D). I love those days when anything seems possible! Look at Mouse! She is getting so big! Ooh, I love the picture of Mouse! She looks so sweet and adorable!! I hope you all have a great week ahead, Wendy! I loved the Tina Fey book! That was so funny. Have a great week! Oh my goodness the time has passed so quickly. I was shocked to see your daughter standing up. It seems like just yesterday you were announcing her birth on your blog. Thanks for my Mouse fix! She gets more beautiful every time I see her. And I love your bookcase! What a great place for photo! Kelly - I didn't think we'd ever get caught up with Supernatural, but we eventually did. I agree though--too much to watch and read and not enough time for any of it! Trisha - I'm with you. Supernatural has gotten off to a good start. Last season wasn't one of the best ones. Kathy - She's a very intent child! 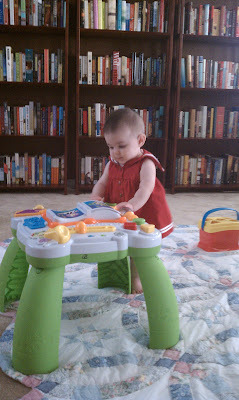 LOL She loves playing with that particular toy--I think more so because she gets to stand up to play it. That's all she wants to do these days, stand up. Sandy - It's so fun to see her taking an interest in her toys beyond just shoving them in her mouth. LOL She still does a lot of that, but I can definitely see the little wheels in her brain turning as she tries to figure things out now. Samantha - Hopefully I will get my review of Bossypants up this next week. I really enjoyed it. I hope you are having a wonderful week too! Joy - Thanks! I agree; Mouse is adorable. Not that I'm biased or anything. Haha! Staci - Days like that are wonderful, aren't they? I can't believe Mouse is nearly 7 months old already. It doesn't seem possible. Yvonne - I really enjoyed it too. I'm so glad I broke out of my comfort zone to listen to it. Kathleen - I can't believe she's standing already too. I'm not ready for her to grow up yet! Linda - You're welcome! :-) And thank you. I really like the bookcases too. If I ever get organized, I'll post before and after photos. AND STANDING?? Oh Wendy--doesn't it break your heart how fast they grow (but at the same time it's so exciting). Hope it's been a good week for you! Trish - It's very exciting--and yes, heartbreaking too. I swear she changes a little bit every day.